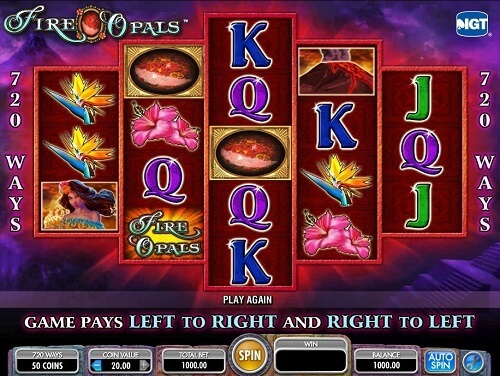 Fire Opals pokie is a 720-ways to win pokie game from IGT. The pokie game boasts five reels in a largely hexagonal creation. There are three symbols on the first and fifth reels, and four on the second and fourth, and there are five symbols on the middle third reel. Give this pokie game a try for free or visit an IGT casino online to play for real money today! The game features a number of free scatters and free spins when compared to Siberian Storm. The symbols on the reels fit the jewelled theme, and they include blue opals, red opals, scatter opals, a woman, the Fire Opals logo, birds of Paradise, a volcano, and an orchid. There are playing card values like K, Q and J, and they are like the playing cards in table games. In place of the conservative paylines and rows of symbols is the Multiway Xtra feature and it offers 720 ways to win for 50 coins per spin. Get three or more matching icons on adjacent reels, and you will secure an immediate credit prize. The main objection is the coin value range, with accessible denominations being AU$1, AU$2, AU$3, AU$5, AU$10, AU$20, AU$30 and AU$50. Free Spins – you get ten free spins to play the game. During the game, a bonus reel set comes into action, and the reel set features more high winning symbols. Bonus Game – There are no bonus features for this pokie. However, the pokie offers 720 ways to win. Fire Opals also plays both ways giving you more opportunities to win.